Give Caesar what belongs to him, says Jesus. And how do we know what belongs to him? It has his image on it. Then: give God what belongs to God. The implication isn’t spelled out, but it’s clear enough. What belongs to God can be identified in the same way; it has his image on it. Human beings, who are made in God’s image, ‘belong’ to God – not in the sense that they are God’s property but – like Caesar’s coinage – they carry the stamp of his authority. A lot has been said and written in recent decades about the evil effects of the old doctrine that humanity reflects God’s sovereignty within creation, encouraging people, so it is said, to see themselves as endowed with unrestricted powers over the rest of the world, with license to exploit and wreck it. But the picture of humanity as God’s image in the world is originally about a particular kind of liberty and dignity, not the unlimited right of ownership but the creative responsibility to make something of the world for the glory of God; to make and to protect a whole environment that speaks of God. So perhaps to give God what belongs to God is to set human beings free to relate to God and to fulfil their calling to be creative in the world. ‘Giving’ humanity to God is acting in such a way that the image is made more visible. It is bringing human dignity to light. So in the gospel story of the tribute money, Jesus refuses to make a neat opposition between Caesar and God, as his critics want him to. By all means, he says, pay your debts to the political order, give Caesar what belongs to him. If you are profiting from Caesar’s government, don’t grumble about paying Caesar’s taxes. But never forget that the ultimate point of any human political order is giving God what belongs to God – setting human agents free, acknowledging and reinforcing the dignity in which God has clothed them. There is the big picture for every politician who seeks to be more than a mere manager of the state’s business, a part of the mechanism of collecting Caesar’s taxes. Good government from a Christian point of view is about the acknowledgement and reinforcement of human dignity. And to see it in this way may help us out of the useless standoff that sometimes arises when we try and talk about what ‘strong’ government is and whether it is desirable. We react against certain kinds of strong government or ‘big’ government on the grounds that we don’t want to be patronised or bullied or stripped of the fruits of our own work. And the mistake is then to hand over all responsibility to non-state agents – which in practice often means non-accountable interests. Or, on the other hand, we try to make sure that government controls all outcomes and averts all risks by law and regulation. And this produces a culture of obsessional legislation, paralysis of initiative and pervasive anxiety. Well, the last three decades have seen plenty of both these odd growths – the delinquent children of Milton Friedman and Sidney Webb. Is it a fantasy to think that we just might be on the verge of discovering another register for talking politics and doing politics? One thing that the remarkable recent election has surely told us is that some of the historic party identities of British politics are not making much sense to a lot of the electorate; party loyalties are not what they were, because people have been unclear about what the arguments really are (despite the high-profile debating). The leaders of a new government, a new leadership in opposition, have the chance to put the question of human dignity at the centre of public debate by affirming that strong government is government that makes strong citizens – not by resigning responsibility but by deliberately building capacity for co-operation, encouraging mutual dependence and skill-sharing, helping to create what some have called a ‘social-quality market’ in which people collaborate to define the goods they are seeking together instead of being reduced to the level of the simple relations between producer and consumer. The marketing – I use the term deliberately – of this latter model to every area of social interaction, including education and healthcare, has been one of the tragedies of the last thirty years and we need something better –something that assumes a shared dignity in citizens, shared across the differences of income and ability, race and class. Shared dignity: it is this, rather than just a set of convictions and enactments around rights alone, that will provide the vision for a society in which the main concerns are to nourish the strength of citizens and enable them to use their strength for mutual care and service, and where the arguments are about how this is to be secured. It is a vision that will never allow the weak, the supposedly ‘unproductive’, the very old or the very young, the mentally ill and physically challenged and terminally ill, to disappear from the radar; on the contrary, it will always ask what are the strengths that they bring, the contribution without which society would be poorer. Shared dignity is the condition for what you could call ‘civic warmth’ – the sense of being able to trust not only immediate neighbours but the wider social fabric. If government is visibly working for dignity in citizenship, trust will follow. And of course it is trust that has in the last couple of years been one of the most signal casualties of our national and international politics. It isn’t only that people have felt they have not been told the whole truth about some matters; much more importantly, they have felt that those who hold both financial and political power have exercised it for self-interest not for the common interest. Some of that perception has been unfair. Most of those in the worlds of finance and politics have been individually honourable and generous. But the ineradicable impression has been of systems that have rewarded or connived at casual greed and routine sharp practice. Across the political parties, there is an urgency about recovering the trust that has been squandered. And perhaps we could also say there is an urgency about restoring dignity to political life itself. The people of the United Kingdom do not want to see politics reduced to entertainment, slogans and personalities. There were telling points in the election campaign where it was clear that the relentless negativity of coverage and the relish with which individuals, including individuals of stature and integrity, were demonised or trivialised or both began to repel the public. No-one should look back on the campaign as a good moment for the dignity of our public life. But the harsh truth is that this kind of dignity has, more than ever, to be worked at. People want an alternative to cynicism – but it will require new levels of seriousness, patience and sheer reasonableness in political debate and relationships. And when one journalist, last weekend, wrote movingly of the dignity with which the grief-stricken people of Cumbria had responded to the horrors they had witnessed, we were reminded forcibly of the underlying seriousness and compassion that is still there in our national life at its best. Our first lesson this morning [Nehemiah 1: 5-11] was a rather scarifying summons to renewal. It shows a great political and religious reformer, a governor of Israel during the period of Persian imperial control, spelling out the consequences of fidelity to God and of infidelity. Faithfulness to the law of Moses means that people will be gathered – drawn together out of exile, out of isolation. Forgetfulness of the law means fragmentation, people losing touch with each other; it is its own punishment. And renewal does not come without acknowledgement of this fragmentation, something for which the entire community of God’s people has to take responsibility, not one leader, not one party, but the people. If we are serious in looking to a new politics of dignity and civic warmth, we must all recognise our responsibilities and the need to give creative, challenging and constructive support to those we have called to govern and to represent us. If we want dignity in our rulers, we must show that we all take responsibility for the dignity we accord to each other as citizens. The unfashionable idea of political virtue needs dusting off as something we can all acquire in our own spheres – a sense of the significance of our decisions, of patience with others and willingness to discover together what is good for a community, even an attitude of celebration of our common life as villages and cities and a variegated national community. In a culture that is increasingly functionalist and unsure how to celebrate, it is a matter of some significance that there still exist as part of the social fabric groups whose strongest means of self-identification is through celebration. Religious believers are not – contrary to what seems often to be taken for granted – individuals who happen to come together occasionally to reaffirm the eccentric opinions they hold. They are people whose imagination is constantly renewed by a celebratory sharing in the great narratives that hold them together, the narratives of God’s actions which have brought them close to each other and whose resonances they recognise in each other. They are a reminder that celebration is not the icing on the cake of a prosperity that looks more vulnerable than it once did, but a simple matter of gratitude for being who we are and receiving what we have received, from God, from history, from our environment. In this country, the Christian Church has historically been the main carrier of this celebratory vision, and its rhythms are still embedded in our calendar just as its buildings and worshipping communities are embedded in every landscape, urban and rural, in Britain. Political renewal is not religious renewal. But a political renewal that looks for a vital, decisive commitment to human dignity and social trust will not get far without a capacity to tune in to the themes of religious practice, the narratives and rhythms of embodied faith, not least, though not exclusively, in the life of the established Church. This is perhaps specially true at a time when we are obliged to confront the possibility of a less individually and corporately comfortable lifestyle. No-one looks for a revival of discriminatory privilege for any faith, still less for some kind of religious censorship in public life. Yet our society is not so rich in resources for the celebration of a dignity which can exist in straitened circumstances just as much as in abundance that it can afford to go on regarding religious communities with the mixture of patronage and nervousness that has become uncomfortably common of late. Give Caesar what belongs to Caesar: this alone is not a recipe for a sustainable society or a trustful one. At best it will create a controlled or managed social order. For a social model more clearly focused on the flourishing of committed and creative citizens, we need a strong ground for the affirmation of fixed and non-negotiable dignity in all human beings. You may or may not as an individual share the perspective of faith; but in the difficult years ahead it will be worth remembering that giving God what belongs to God is something that is not a matter of dry and unwelcome duty but a release of human possibilities that we all need to witness and in some degree share. May this Parliament mark a new level of enthusiasm and imagination around the call to honour God-given dignities by creating strong citizens of our nation and of the world; may the work of our elected leaders be for the sake of gathering and not scattering; and may the divine image in men and women, recognised or unrecognised, be the vision that directs us towards a fresh political energy and moral vision. 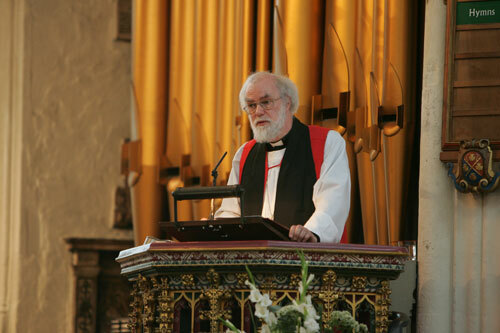 The Service for the New Parliament was conducted by the Reverend Robert Wright, Rector of St Margaret’s and Chaplain to the Speaker of the House of Commons. The Lord Speaker, the Baroness Hayman, read Nehemiah 1: 5-11a and the Speaker of the House of Commons, the Right Honourable John Bercow MP, read Matthew 22: 16b-21. Prayers were led by Reverend Michael Macey, Minor Canon of Westminster and said by the Right Honourable Sir Alan Beith MP; Tom Harris MP; Commissioner John Matear, Territorial Commander of the Salvation Army; the Reverend Dr John Oloyede, Pastor of the City Chapel; the Most Reverend Vincent Nichols, Roman Catholic Archbishop of Westminster; the Most Reverend Dr Barry Morgan, Archbishop of Wales; and the Right Honourable Sir George Young MP, Leader of the House of Commons and Lord Privy Seal.